After two decades of fundraising, praying and begging three successive Bishops to provide them with their proper Place of Worship, their prayers were answered when Bishop Gabriel Malzaire granted permission to build a small chapel. The land was provide by Mr. and Mrs. Alan BRUNEY. Adveniat and pontifical Mission Societies provided financial assistance. 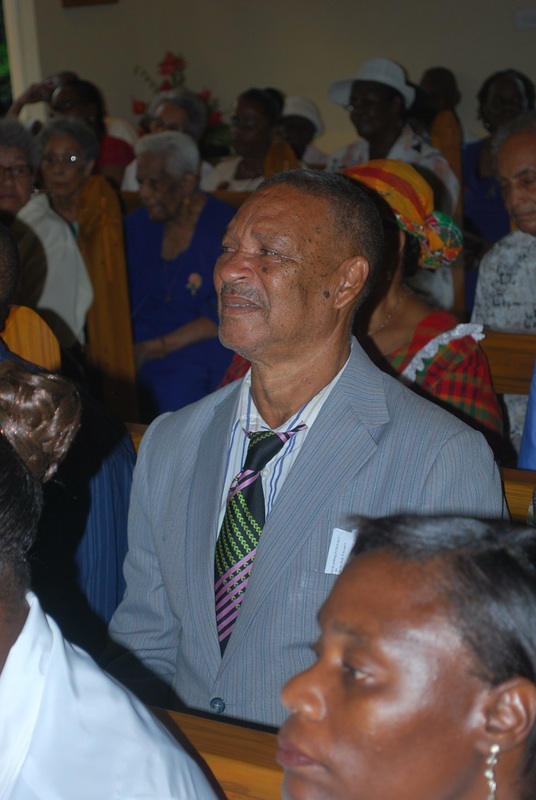 Many parishioners and wellwishers gave what talent and resources they could. 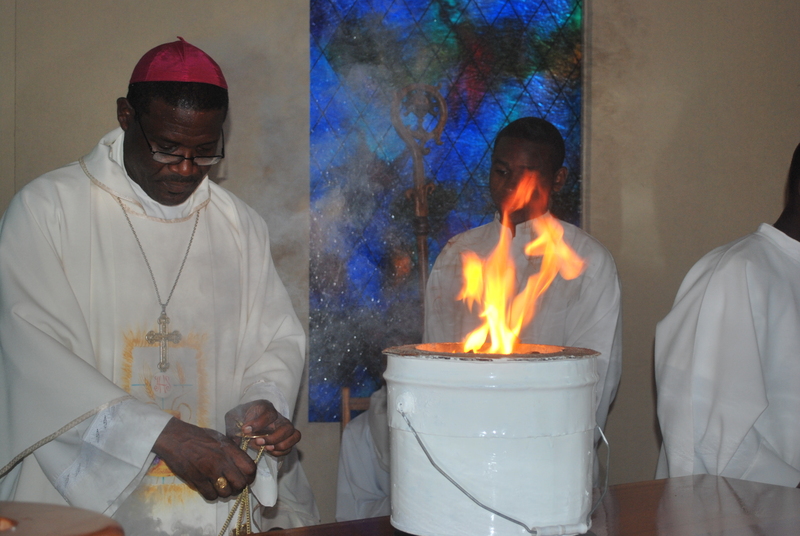 The Chapel was dedicated and bless by Bishop Gabriel Malzaire on June 6, 2010. 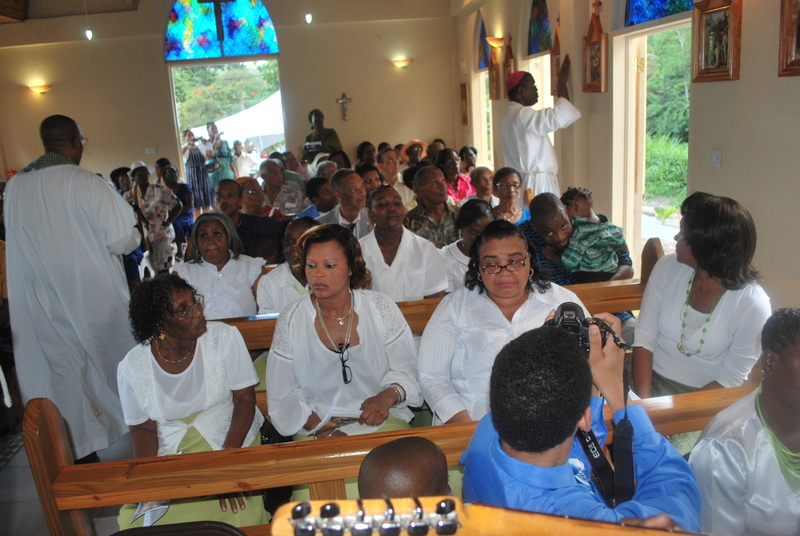 This, the members of the Catholic Community of COCKRANE set out to do more than 2 decades ago with a faith and determination that I have not encounter anywhere else in my 30 years in Dominica, and today you see the result of their efforts and their many prayers. “this is the land for the new chapel in Cockrane“. Of course this community did get some generous help from the St. Alphonsus Parish, many individual benefactors and the wider catholic world community. 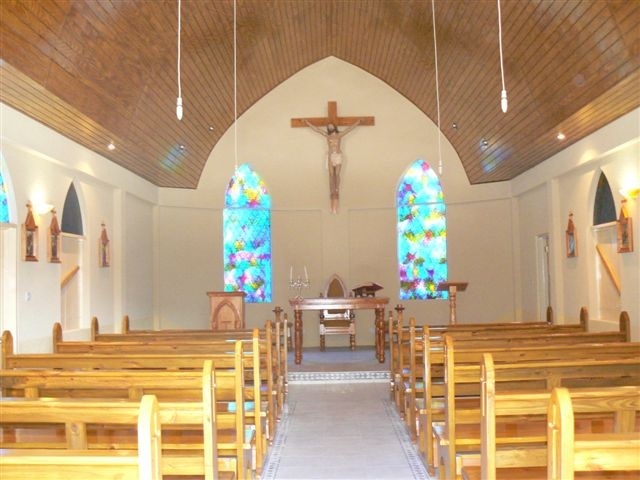 What is so Catholic about these furnishings , what items do we need in a Catholic chapel ? and I want to stress on this because we are sometimes unsure about our own Catholic heritage and identity. and this is true BUT A GATHERING OF PEOPLE DOES NOT MAKE A PLACE SACRED !! GOD only can make a place sacred !! So even when the building is empty of people, once the Blessed Sacrament is present, the Real Presence is here. CHRIST is present in the waters of Baptism, here represented in the Holy Water font at the entrance. CHRIST is present in the Tabernacle and we can see the whole chapel building as one large TABERNACLE. THIS IS THE ESSENCE OF A CATHOLIC Church or chapel. In addition we notice the large CRUCIFIX behind the ALTAR. NOT an empty cross !!! with the corpus of a suffering dying Jesus. 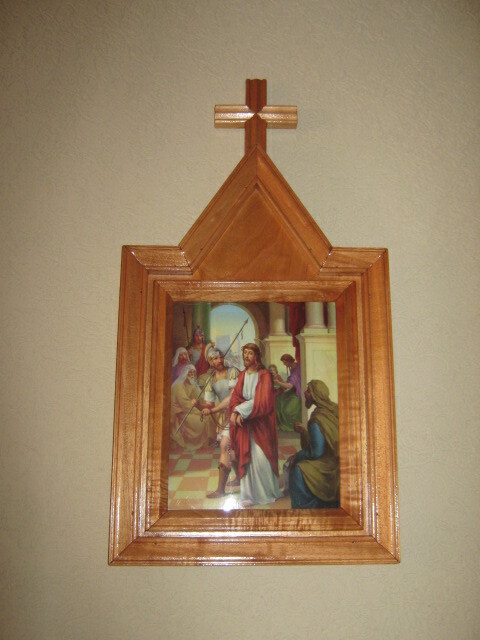 The Passion of the Lord is also depicted in the traditional 14 Stations of the Cross. The patron feast of this chapel THE PRESENTATION OF JESUS IN THE TEMPLE, is a feast of both from the Life of Jesus and of his Mother Mary. And of course no catholic church or chapel should be without an image of the VIRGIN MARY, the mother of God. Acacia was chosen for its durability which is similar to own Red Cedar. The altar you see here was built with Red Cedar. Psalm 78:19 asks us ” CAN GOD SPREAD A TABLE IN THE DESERT?” the desert of disbelief, unbelief, negativity, sceptism, darkness. Today this altar has been consecrated by our Bishop Gabriel which include sprinkling with Holy Water, oiling with Chrism OIL, the placing of the white altar cloth and the installation of candles . Holy water, oil, fire and light (as Christ is the LIGHT who came in the darkness and this celebrated in CANDLEMAS on Feb 2, which will be your parish feast). ” CAN GOD SPREAD A TABLE IN THE DESERT?” the spiritual desert we live in today. YES HE CAN !!! God has pitched his tent in Cockrane TODAY. and we are all part of this event . In closing I wanted to provide a few word on BEAUTY and SYMBOLISM in this new place of worship. The fact is that our environment does influence us and architecture is a powerful force on us. 1.this chapel is located , on the mountain. The old and new testament are full of people who “went up the mountain to meet God” Moses, Isaiah even Jesus went up the mountain to pray to his Father. 2. The shape of this chapel : This is a cruciform chapel, in the shape of the cross As I mentioned at the ground breaking ceremony: The shape of the cross firmly embedded tin these foundations in the soil of Cockrane. 3. the ceiling: The ceiling over the nave in this chapel looks like an upside down ship. The word nave comes from Latin navis, meaning ship, the root of the English word “navigation”, “navy”. The association of the Church with a ship (or ark) is well known and this chapel will contain the congregation and celebrant traveling together towards God. Beauty is a word we seldom hear these days. Our buzz words are usefulness, functionality, efficiency, productivity, cost benefit. In a document published in 2006 by Pope Benedict XVI named “Sacramentum Caritatis “, there is a chapter on Beauty and the liturgy wherein he mentions the word BEAUTY more than 25 times :and I quote ” Like the rest of Christian Revelation, liturgy is linked to beauty. The liturgy is a radiant expression of the paschal mystery, in which Christ draws us to himself and calls us to communion. …, in Jesus we contemplate beauty and splendour at their source. The truest beauty is the love of God, who definitively revealed himself to us in the paschal mystery. Beauty is a powerful means to draw us closer to the Mystery of God. to celebrate the glory of God. I hope that these walls and each small crevice in them will soon be filled with your prayers . May these walls soon shout LOUD. loud of the Faith of God’s people of Cockrane.